It’s one thing to say “no” to what you don’t want to do anyway. It’s quite another thing to say “no” to things that you do want to do. Why would you? To make space for what you REALLY want to do. Now that’s commitment! Find out about the benefits of saying “no” and how making space doesn’t have to mean you’re forcing yourself to choose a niche. Do you know how it’s difficult to develop an elevator phrase or a 2-minute pitch? How hard it is to get your point across and say all that you want to say in a short period of time? Now imagine when it comes to getting the attention of a prospective customer or client in a noisy marketing world, you have 9 seconds or less to get their attention. That’s the challenge with branding. That’s why branding is a 9-second pitch. What’s the fastest way to grow your business and be profitable? Should I tell you or make you listen to the episode? Hmm…..alright, I’ll tell you. It’s to only work with your ideal customers. Does that sound obvious? Then why do so many businesses accept whatever business comes along and never get ahead? You’ll have to listen to the episode to understand how working with your ideal customers is your #1 growth strategy and especially to hear what NOT to do. Customer retention is one of the most important metrics for any business to follow. In this episode, I share my thoughts and practices about how to create amazing customer retention to prepare you to learn the strategy to do so from the guest on our next episode, Joey Coleman. Customer retention is a strategy, not a “nice to have.” For every customer that you retain, you make doing business easier and easier, year after year. Like my TEDx talk, Validation Paradox: Finding Your Best Through Others, in this episode I clarify how working with your ideal customers also brings out your best. By surrounding yourself with people who can see more in you than you can see in yourself, you will rise to unimaginable heights. After years of coaching clients through major pivots in their lives and having done more than a fair share of pivots in my own life, this episode will offer you some things to consider. There are several things that are inherent in making a change and pivot in your life. It will be very helpful for you to know what to expect. One of the more important topics in my book, LINGO, is about customer experience (Chapter 9). It’s very important we think about customer service different than we used to. Simply put, we should consider not giving the experience we want our customers to have, but instead, pay more attention to the experience they WANT. Have a listen and get the latest insights about how to be sure your customers have an awesome customer experience. By traditional definition, lingo means to speak the jargon of a group or individual. It’s important as we continue to discuss lingo and the lessons taught in my book, LINGO, that you understand how I define it. I define lingo as understanding someone’s essence. Ironically, to speak someone’s lingo is more about the unspoken word. It’s creating the energetic connection that you get each other and are speaking the same language. Yes, the words and jargon are important. But only after you “get” them. When you think about your business as building a community and not just a business, it ups the game about how you think about the people who are going to provide for your business and your life. You will treat them as you would treat your friends and peers; as if you were going to meet each person face to face and make it a personal experience. I also provide some tips on how this can affect your email practices and how to create brand bonding. 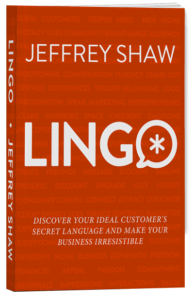 I wrote LINGO to teach the 5-Step Secret Language Strategy to attract your ideal customers. What I realized afterward are all the other ways knowing your ideal customer’s secret language can affect your business in a positive way. For example, in this episode, I talk about how this in-depth understanding of your ideal customer can help you determine what services best serve them. That “speak” to them.